Last month I got my first placing on the podium in an international competition, and now I did it again! The theme for Unterwasser Visions in October was «Drama» and the jury liked my picture better than most. When you have a theme, and want to find, or take, a picture that fits the theme it is not always so easy. This month however I was not in doubt. A couple of years ago I was in Dauin, Philippines, one of my absolute favorite dive spots, and suddenly I witnessed a drama tougher than anything I had seen before. In the beginning I could not even understand what I saw. On the sandy bottom what looked to me like a very strange creature was laying. The front part was obviously a fish, but the end of it was furry, and did not look like any fish I had ever seen. It took me quite a while until I understood what was going on – not one or two, but three fire worms where eating the poor little goby alive! 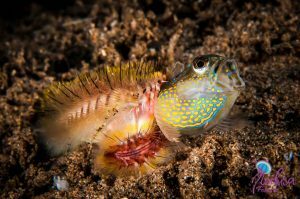 To witness the goby turning its eyes, the mouth gasping and silently screaming for help, while the worms literally swallowed the fish in one whole piece was both fascinating and heart breaking. Being an underwater photographer I always seek to find the unique, something special, and this was definitely one of this moments that you never know if you ever will experience again. While my heart was bleeding for the goby, the photographer in me recognized the uniqueness in the situation – and this gave me the second placing on a podium in this competition. In addition to the jury placing me third, the public also voted my contribution to a 7th place – so a double top-ten this time!